I was fortunate this past week to spend another wonderful evening with Annette and her parents, cooking, laughing, and making a huge mess of Eva’s kitchen. That’s what we do. Annette had a full agenda planned and we were amazed at how much we accomplished. The goal was to test one meatloaf recipe, one smushi recipe, two potato recipes, one green bean recipe, two sauce recipes and two dessert recipes. In Eva’s kitchen the three of us were a blur, each working on a couple things at a time, bumping into each other occasionally, and washing dishes intermittently so we’d still have utensils to use. We’ve learned to work together so well and we find that delightful. Somehow it all worked and we sat down with Ole to enjoy the fruits of our labor. The whole night felt like the true definition of hyggelig, enjoying each other’s company with delicious food in a cozy setting. The definition of hyggelig. Though all the cooking was done to prove out recipes, it all flowed so beautifully that Ole felt certain we had planned the menu completely for his enjoyment. Eva loves to use her Royal Copenhagen dishes so the table looked beautiful. She told me a story from early in their American life. Eva uses crocheted napkins to preserve her plates when she stores them and one time she forgot to remove them before setting them out for her guests. She later noticed, to her horror, that some people had left those napkins on their plates and piled their food onto them. One friend later told her she thought that was how Danish people served food and she didn’t want to be rude. If you’re wondering how the food turned out, our favorite, hands down, was the Jansson’s Temptation, a decadent potato dish of Swedish origin. 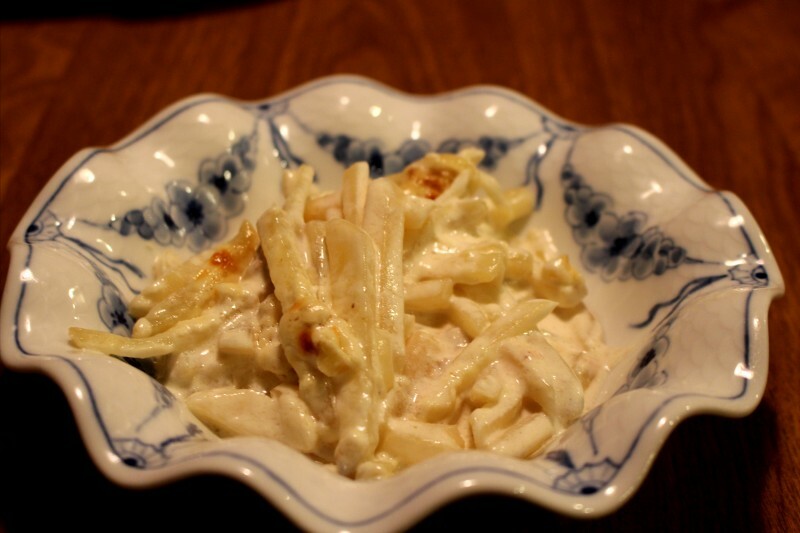 It was creamy, rich, satisfying and featured a complex mixture of flavors, including anchovy. None of us could help having second helpings. We’ve been branching out a bit lately into dishes from other Scandinavian countries and it’s been quite rewarding (and delicious!). The two desserts were decadent as well. One was a raspberry snitter (think home-made Pop Tarts), shown below. This is a more exotic version than we’d been experimenting with. It started with a simple shortbread-like crust, which we baked for a few minutes, then topped with raspberry jam. Then Annette added squiggles of the batter on top to create the zebra look. The other dessert was a light cake, spread with red currant jelly, then topped with meringue. 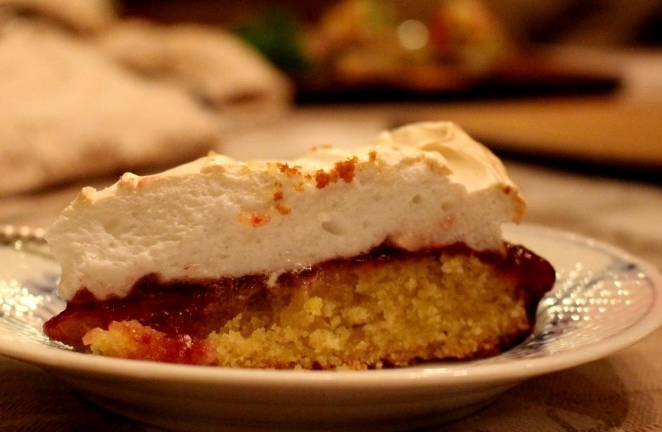 We baked the meringue to give it a crisp texture and deeper flavor. It was as delicious as it looks. We also marveled at how easy it was to make, as it looked a bit complicated. We’re planning more work on this one, so stay tuned. We have these lovely pictures thanks to Annette’s sister-in-law, Kristina. She has an excellent eye. It was great to have her there with us, all the more hyggelig! 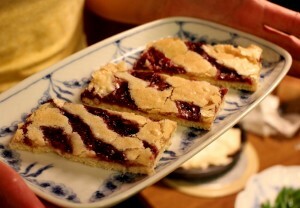 In case you missed these above, here is the link to the Jansson’s Temptation recipe again, with full credit going to Food.com and the recipe submitter, Engrossed; and here is the link to the raspberry snitter recipe again, with full credit going to Jeanette Jewel.blog.se.